On this page we will feature quotations and thoughts of and about karate. This color represents the latest addition to our Words of Wisdom. Lee is not just talking about using our martial skills for combat in this quote. He is talking about living the precepts of the martial arts daily. He means that as we show respect in the dojo, we should also show the same respect on the street. Because Karate teaches us humility, respect, loyalty, integrity, honor and much more, we must make a conscious decision to relentlessly practice Karate in the pursuit of being a true representative of the black belt ideal in every sense of the word, both inside and outside of the dojo. When the old masters told us to use Karate in our daily lives, they weren’t just talking about the punches and kicks. Real Karate has the power to end life, and with that power comes a moral responsibility. That’s why a black belt is not really a belt. It’s a state of mind; a way of life. Anko Itosu (1832-1915) was one of karate’s true innovators; he was the creator of the Pinan kata and was responsible for introducing karate onto the Okinawan school system. To make karate suitable for children, Itosu watered down the karate he taught to them. As part of this, he started teaching kata without their applications so that the children could gain the physical benefits of kata training without irresponsibly giving them knowledge of the violent and brutal methods the kata were created to record. 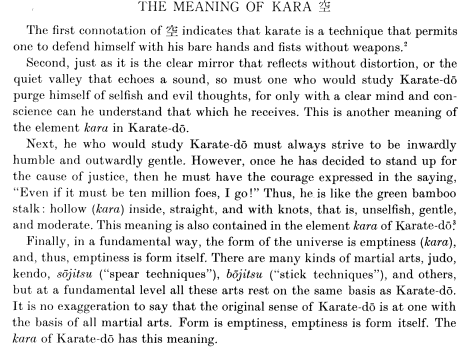 In 1908, Itosu wrote a letter outlining his views on karate and explained why he felt karate should be introduced on to the Okinawan school system. This letter gives us an insight into karate as it was coming out of the shadows and beginning its journey to becoming an art practised by millions. “Karate did not develop from Buddhism or Confucianism. In the past the Shorin-ryu school and the Shorei-ryu school were brought to Okinawa from China . Both of these schools have strong points and I therefore list them below just as they are without embellishment. Karate is not merely practiced for your own benefit; it can be used to protect one’s family or master. It is not intended to be used against a single assailant but instead as a way of avoiding injury by using the hands and feet should one by any chance be confronted by a villain or ruffian. The purpose of karate is to make the muscles and bones hard as rock and to use the hands and legs as spears. If children were to begin training naturally in military prowess while in elementary school, then they would be well suited for military service. Remember the words attributed to the Duke of Wellington after he defeated Napoleon, “Today’s battle was won on the playing fields of our schools”. Karate cannot be quickly learned. Like a slow moving bull, it eventually travels a thousand leagues. If one trains diligently for one or two hours every day, then in three or four years one will see a change in physique. Those who train in this fashion will discover the deeper principles of karate. In karate, training of the hands and feet are important, so you should train thoroughly with a sheaf of straw (#). In order to do this, drop your shoulders, open your lungs, muster your strength, grip the floor with your feet, and concentrate your energy into your lower abdomen. Practice using each arm one to two hundred times each day. When you practice the stances of karate, be sure to keep your back straight, lower your shoulders, put strength in your legs, stand firmly, and drop your energy into your lower abdomen. Practice each of the techniques of karate repeatedly. Learn the explanations of every technique well, and decide when and in what manner to apply them when needed. Enter, counter, withdraw is the rule for torite. When you train, do so as if on the battlefield. Your eyes should glare, shoulders drop, and body harden. You should always train with intensity and spirit as if actually facing the enemy, and in this way you will naturally be ready. If you use up your strength to excess in karate training, this will cause you to lose the energy in your lower abdomen and will be harmful to your body. Your face and eyes will turn red. Be careful to control your training. In the past, many masters of karate have enjoyed long lives. Karate aids in developing the bones and muscles. It helps the digestion as well as the circulation. If karate should be introduced, beginning in the elementary schools, then we will produce many men each capable of defeating ten assailants. (#) – Translator was not a martial artist and hence translated the word “Makiwara” to “Sheaf of Straw” when leaving the word un-translated would have been fine. I had thought about what kind of a kata that would be good for the Shindo and decided that a Kitagawa kata would best fit the movements of the Shindo as well as capture the essence of Sensei Shintani’s movements. Seisho seemed liked a very good fit because it was not too long and was full of explosive movements. So, I proceeded to put together the kata and the Shindo, refining the movements over a period of about 6 months. I had told Sensei Shintani that I was doing this and had his approval, but he had not seen any of the work I had done at that point. He then asked me why I had chosen Seisho from all of the Kitagawa katas that were available and I told him that it seemed to me that it represented his movements and explosiveness so very well. He said to me, “That’s really interesting, Bob, because of all the Kitagawa katas that’s the only one I had created myself. All the rest were Sensei Kitagawa’s.” He found it very interesting that I was able to zero in on his movements from the kata and select the one he had created even though I had no knowledge that he had done so. We then went upstairs to my kitchen and he asked me for a cup of tea. As I was making the tea he was sitting at the table writing. When I served him the tea he handed me a Shindo certificate and said, “You are now a 7th Dan in Shindo. Then he looked at the cup of tea and said, “Oh that’s beautiful, just beautiful.” After he finished the tea he turned on the baseball game and we didn’t discuss karate or the Shindo the rest of the evening, only baseball.